Last Updated 1:36 p.m. ET. Afghanistan's chief electoral officer said Monday that a presidential runoff election scheduled for this weekend had been canceled, thereby securing a second term in office for current President Hamid Karzai. Daoud Ali Najafi gave no details, but a second senior official on the commission also confirmed the second round has been called off. Former Foreign Minister Abdullah Abdullah pulled out of the two-man race Sunday, effectively handing Karzai a victory. The two had been in talks about a power-sharing deal, but CBS News correspondent Mandy Clark reports news of the canceled election will come as a blow to the Abdullah camp. Abdullah chose not to boycott the vote, a conciliatory move that could mean he was still hoping for a deal. The White House said Monday President Barack Obama planned to call Karzai this afternoon about his victory. Spokesman Robert Gibbs said, "Now begin the hard conversations about ensuring credibility, ensuring and improving governance, addressing corruption. We are focused on what has to happen in order to have a credible partner." Gibbs also said that Americans should "take heart" that the laws and institutions of Afghanistan had prevailed. CBS News White House correspondent Mark Knoller reports that Gibbs believes the Karzai government would be accepted. "I don't think there's any reason for the Afghan people to think this government isn't as legitimate as it is," he said. While the news prompted words of support from the administration, it also elicited demands from Mr. Obama's critics. House Republican leader John Boehner said that because Karzai will remain in office, the president has "no more excuses" for not announcing a decision on his strategy in Afghanistan and Pakistan. The announcement of the canceled runoff came as the head of the United Nations made a surprise visit to Afghanistan - another sign of international concern and mounting pressure for a quick resolution to the country's electoral turmoil. 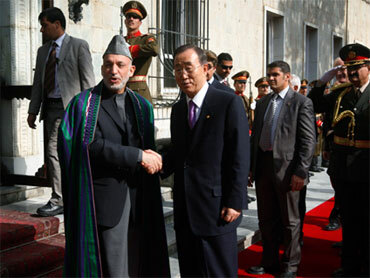 U.N. Secretary-General Ban Ki-moon met with Karzai and Abdullah "to assure them and the Afghan people of the continuing support of the United Nations toward the development of the country," the statement said. A deadly attack last week on a Kabul guest house where U.N. election workers were staying has raised questions about whether the U.N. might scale back in Afghanistan. Militants stormed the compound before dawn, killing five U.N. staffers and three Afghans. The U.N. kept operating after an August 2003 truck bombing at its headquarters in Baghdad, which killed 22, including mission chief Sergio Vieira de Mello, but after a second bombing it shut down operations in Iraq in late October 2003 for years. Ban will also meet with U.N. staff and security officials, the statement said. Taliban threats of more violence and the difficulty of organizing and securing the balloting mean officials were likely looking for a way to end the process without sending people back to the polls this week. Karzai had said the runoff should go forward as planned, but there was no clear article in Afghanistan's constitution or electoral law to address the situation. The chairman of the Independent Election Commission, Azizullah Lodin, said Sunday that he would have to meet with constitutional lawyers before deciding how to proceed. It has been more than a month since the Aug. 20 balloting that aimed to strengthen the Afghan government but instead undermined its credibility both at home and with key allies like the United States. The vote was characterized by rampant ballot-box stuffing, and fraud investigators threw out nearly a third of Karzai's votes. That move dropped Karzai below the 50 percent threshold needed to win outright, forcing the runoff vote. A bevy of international figures, including U.S. Sen. John Kerry, U.S. Secretary of State Hillary Clinton and British Prime Minister Gordon Brown, were involved in convincing Karzai to accept the runoff vote. U.N. and U.S. representatives were still involved in negotiations with the two about a power-sharing deal as recently as Sunday morning, according to a Western diplomat who was familiar with the talks but spoke anonymously because of the sensitivity of the discussions. The U.S. and the U.N. have both issued statements calling for a quick resolution now that Abdullah has bowed out. White House spokesman Robert Gibbs said President Obama would call Karzai this afternoon on his reelection. Abdullah has said his decision not to participate in the runoff is final. But in a sign of how much the situation is in flux, a spokesman said Monday that they could be open to still having a second round if it is delayed to put in safeguards to prevent fraud. "Lots of opportunities have been missed and election day is very close," Fazel Sancharaki said. "If President Karzai accepts Dr. Abdullah's conditions we are thinking of a second date for the election."